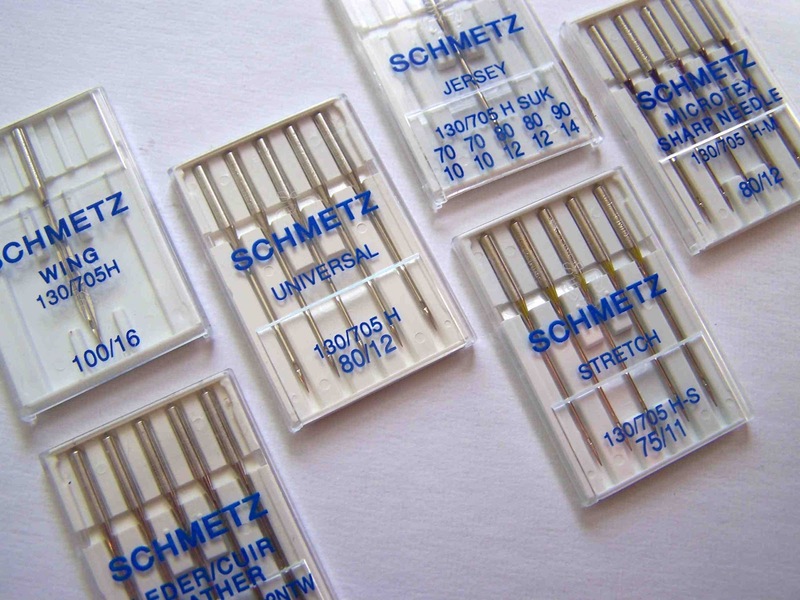 Last week I shared a few links related to selecting the proper sewing machine needle for your project. Using the correct needle for the job can both make the sewing process easier, and prevent problems with your seams as a garment is worn. Something else that you need to consider with your sewing machine needles, is how often you change them. Just like a pair of tires on your car, sewing machine needles wear out with use. Needles can break, bend, and burr, all of which can effect the quality of your stitching, and permanently damage your sewing machine. So how often should you change your sewing machine needle? Well, whenever it is damaged, or every 6-8 hours of continuous sewing. Continuous sewing is a hard one for me. I sew at least that much a week, but I am usually working on multiple projects, and switching between different types of needles. At times I'll slip a new needle into my sewing machine, and then pop it out after sewing a seam or two. The needle is still perfectly good, and doesn't need to be discarded. Try to keep track of how much use a particular needle has had. You may want to store used needles in a separate needle case. Make sure that you take the time before you start a new sewing project to examine your needles to ensure that they aren't burred or bent. Also, don't force a sewing project through your sewing machine. Forcing material or seams can cause unseen damage to your machine's needle, which in turn will damage your machine. Removing pins as you come to them can also prevent needles from bending and breaking. You will likely be able to tell if your needle is damaged or dull, just by how your sewing machine sounds. It may not run as smoothly, or if your thread continues to break or snag, it's a sign that your needle may need to be switched out. My mother taught me to change my needle after every project. But I probably change after every 3-4 projects. Another tip my mom gave me (I don't know if you covered this), is to never pull threads through the machine backwards (like when you change thread). And don't pull thread through the bobbin backwards. You should always snip the thread and pull it through in the direction the thread moves when you are sewing. I sew everyday and yes you need to change it every project, I have my machine cleaned once a year, I sew for other people and I can tell by the sound of the machine when a needle needs to be changed. Happy sewing. Singer brand is very trustworthy and old which is having so much popularity in sewing world, Who are doing sewing they may know the importance of using sewing machine of good brand. As there are so many brand are exist in the market but no one like a singer as it has so many features and so many quality things which makes it different than anyother sewing machine. You can See more about this sewing machine brand.